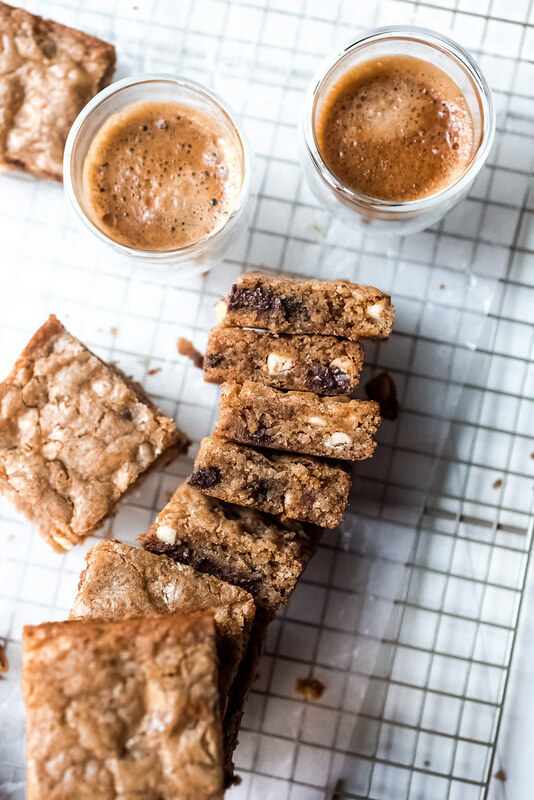 Espresso Chocolate Chip Blondies: An unforgettable,versatile, and genius base recipe that’s jam packed with espresso and two kinds of chocolate. Is there anyone out there who would dispute that a fudgy, chewy, chocolate brownie is not one of the best things on the planet? How could you? I mean, I have 17 – SEVENTEEN – different brownie recipes on this site. They range from the outrageous red velvet with white chocolate buttercream to traditional chewy and dense. From pumpkin cheesecake to peanut butter cheesecake. From salted caramel filled to salted caramel and peanut topped. You get the point, right? At this point, you may be asking, “Why the heck is this chick up-talking brownies when she’s supposed to be talking about blondies?” That’s a fair question. 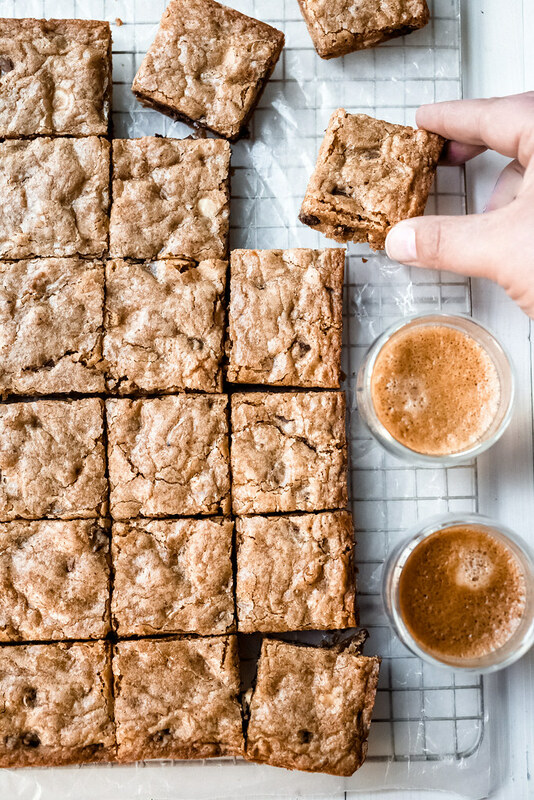 Well, these espresso chocolate chip blondies just may have overtaken my love for brownies. I have made a few blondie recipes in the past, my absolute favorite being of the gingerbread variety. And since it’s been so long since I’ve made a traditional blondie, I thought it was high time to summon a new recipe up and share it with you all. It IS the weekend after all! Nix the espresso and white chocolate then add some peanut butter cups with the chocolate chips for a super indulgent blondie. Or maybe add some orange zest to go with those white and chocolate chips! Adding some chopped dried fruit and dark chocolate chunks would be excellent too! Peppermint oil with the white chocolate chips would be a nice change for the upcoming holiday baking season. Toasted coconut and lime zest would make an excellent tropical spin! Like I said, this recipe is versatile and fun! How could you go wrong? If you’re looking or a super traditional Christmas blondie though, let me point you back to my white chocolate gingerbread blondies. That base recipe is slightly different from this one and they are ALWAYS one of the quickest treats to go on my holiday cookie platters. 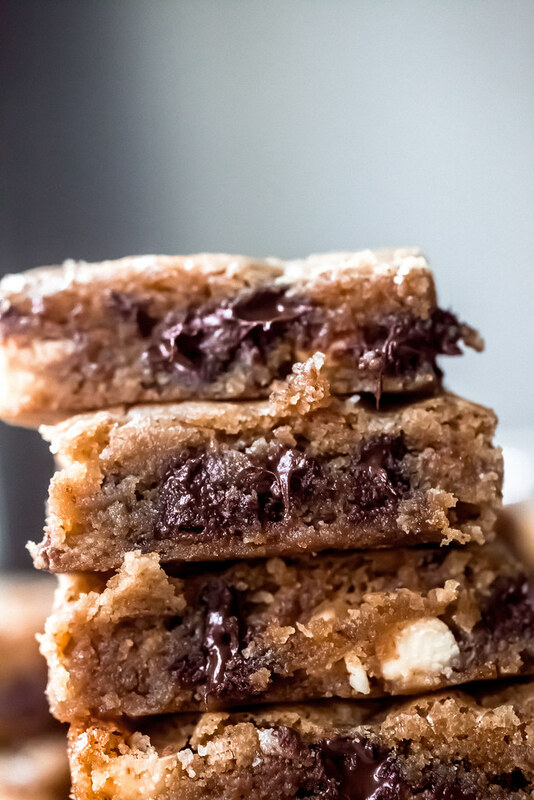 These espresso chocolate chip blondies themselves, however, are downright delicious. They’re chewy like a good blondie should be. No hint of a cakey blondie here at all. Nobody likes a cakey blondie! The espresso powder gives them a deep, almost mature flavor that balances the sweetness of the brown sugar in blondie really nicely. 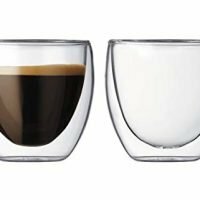 And of course, espresso + 2 types of chocolate is a big win in my book every day of the week. 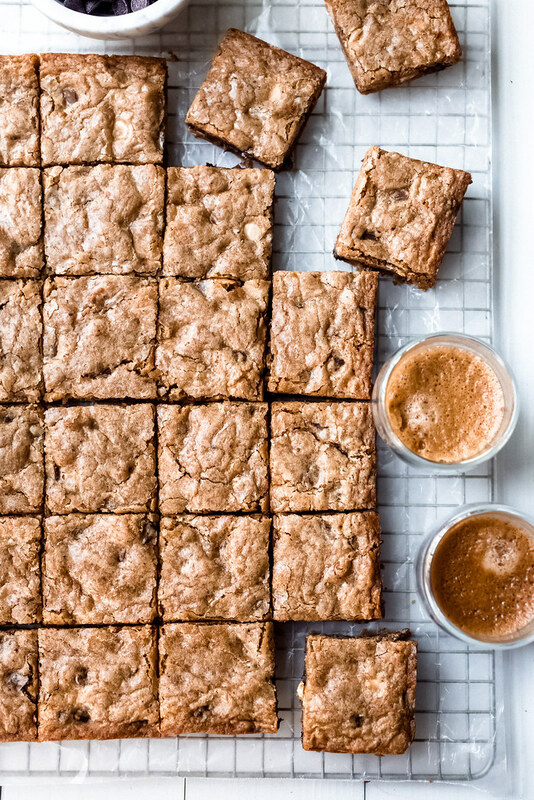 Can You Freeze Blondies (or Brownies)? Why, Yes! Oh! And they freeze exceptionally well too! Can you even believe I was able to sneak a few into the freezer before Kyle noticed they were gone? I simply wrapped a few of the cut up blondies in foil and froze them. After a couple of weeks, they had slowly disappeared from the freezer but I assure you that each of them were eaten judiciously. 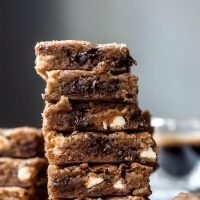 And in all honesty, I loved these espresso chocolate chip blondies just as much straight from the freezer as when they were freshly baked. Deb from Smitten Kitchen notes that she loves her favorite brownies more from the freezer than fresh from the oven. I’m juuuust about on the same page with these blondies. Paired with a hot cup of coffee, ice cold blondies definitely hit the spot. So let me say this: no matter how you eat these blondies, you will LOVE them. Promise! 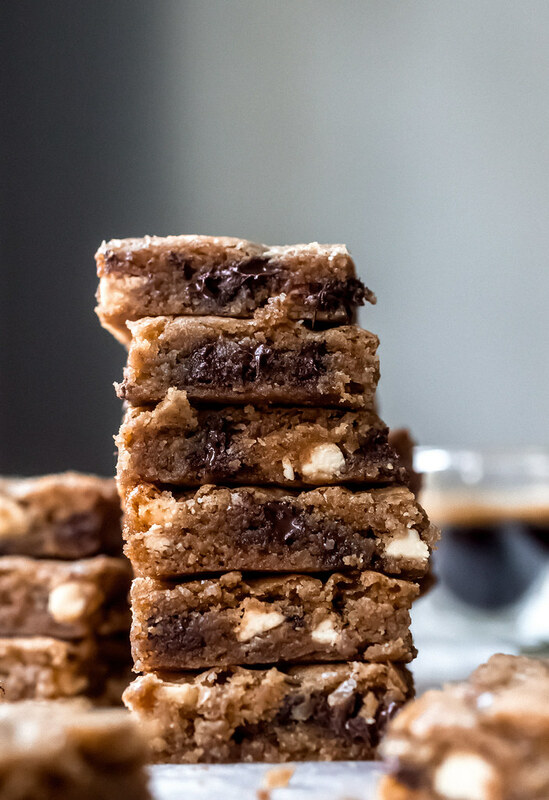 This recipe for espresso chocolate chip blondies, with tons of espresso and 2 kinds of chocolate, is an unforgettable, versatile, and genius base recipe for lots of different add-ins and toppings. See the Notes section below for ideas! 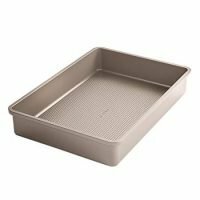 Preheat oven to 350° F. Grease and line a 13×9-inch baking pan with parchment paper, making a sling with the paper by leaving a 1-inch overhang over the top of the sides of the pan. 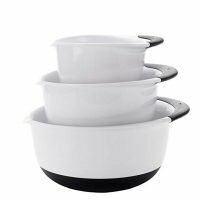 You'll need this to lift the blondies out of the pan. If you'll be serving them from the pan, skip the parchment altogether and just grease the pan. In a medium bowl, whisk the flour, espresso powder, baking powder, and salt together. In a large bowl, whisk the melted butter and sugar together until well-combined. Whisk the eggs in along with the vanilla. Fold the dry ingredients into the wet ingredients with a rubber spatula until just combined. Fold both types of chocolate chips into the batter, just until combined. Do not overstir. Scrape the batter into the prepared pan and work it out to the sides and into the corners of the pan in an even layer. Smooth out the top. Bake for about 22 minutes, just until the top is shiny, crackled, and golden at the edges. Do not overbake. Transfer the pan to a wire rack and allow the blondies to cool completely in the pan. When you're ready to cut and serve, pull them out of the pan using the parchment sling and transfer to a cutting board. Cut into 24 or 36 squares. To freeze, wrap squares in foil and stick the foil packet in a zip-top bag, and squeeze all of the air out of the bag before sealing. Freeze for up to 2 months. 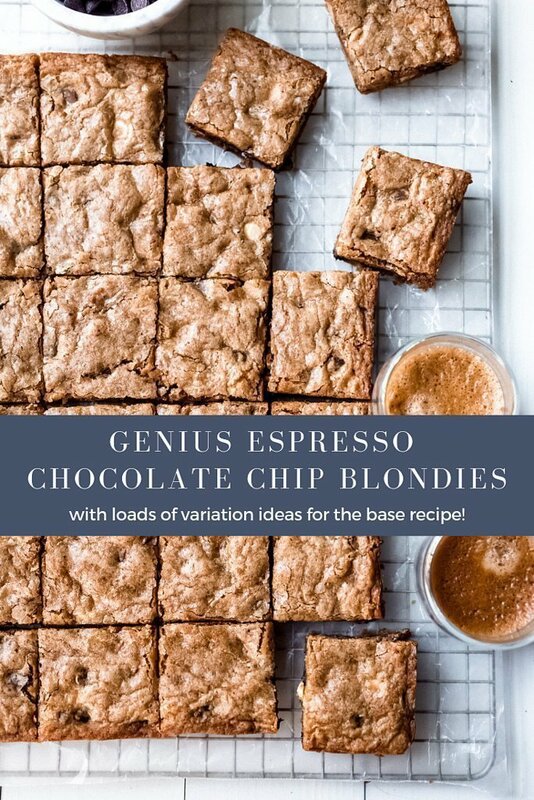 - Nix the espresso and white chocolate then add some peanut butter cups with the chocolate chips for a super indulgent blondie. - Or maybe add some orange zest to go with those white and chocolate chips! - Adding some chopped dried fruit and dark chocolate chunks would be excellent too! - Peppermint oil with the white chocolate chips would be a nice change during the holiday baking season. - Toasted coconut and lime zest would make an excellent tropical spin!